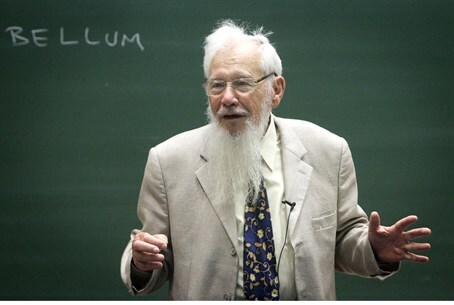 Nobel Laureate Professor Yisrael Aumann says High Court 'corrupt', poses danger to Israel's democratic fabric. The Israeli High Court is "the biggest problem" facing the State of Israel, according to Nobel Prize Laureate Professor Yisrael Aumann. Speaking at an event entitled "A State Ruled by the High Court: The High Court's Indictment Against Israeli Democracy," chaired by grassroots Zionist students' organization Im Tirzu, Aumann claimed that the High Court's activism in overruling laws passed by democratically-elected legislators posed a serious threat to Israeli democracy. "(Former High Court President) Judge Aharon Barak once told me that him and the Supreme Court are like the Sages of the Talmud," Aumann recalled of the notoriously activist Barak. "Judge Barak needs to wake up: we are living 1,500 years after the era of the Talmud." Aumann took aim at the Supreme Court's recent decision to overrule the "Infiltrator Law" aimed at deporting the tens of thousands of illegal immigrants from Africa currently residing in Israel. "The High Court's decision to close the Holon facility relied upon Basic Laws like Human Dignity and Liberty," said Aumann, referring to the facility in southern Israel where some 2,000 illegals were detained and which the High Court, in its ruling, ordered to close. The State of Israel does not have a constitution; instead, the High Court relies on a series of "Basic Laws" which were passed piecemeal by various Knessets. The Basic Law: Human Dignity and Liberty was passed in 1992 - but Aumann questioned its legitimacy in overruling another law (the Infiltrator Law) which was itself endorsed by a significant Knesset majority. "That (Basic) Law passed with a (Knesset) majority of 32 against 21. That means that less than half of the Members of Knesset took part in the vote!" noted Aumann. "The Basic Law: Human Dignity and Liberty sounds like a really lovely law. Who could oppose something like that?" he asked hypothetically. "The problem is that the High Court decides when qualifies as 'human dignity' and what the values of the State of Israel are!" Aumann went on to accuse the High Court of corruption. The judiciary is corrupt not in the sense that it accepts bribes, he explained, but insofar as it is being used to further a particular agenda and consolidate its own power over the country, as opposed to upholding justice for the citizens of Israel. Also speaking at the conference, Im Tirzu's founder Dr. Ronen Shoval cited the 2004 murder of the Hatuel family by Palestinian terrorists as an example of Aumann's position that the High Court was serving a specific political agenda and not the interests of the Israeli people. Shoval noted how in 2004 the Hatuel family - mother Tali, who was eight-months pregnant, and her four daughters aged 2 to 20 years - were murdered while driving in Gush Katif by terrorists who fired at them from a building which the High Court had forbidden the IDF from demolishing. Residents of Gaza's Jewish communities had called for the building to be demolished, citing concerns it could easily be used for a terrorist attack - but the court refused on the grounds that demolishing the building could infringe on the rights of local Palestinian Arabs. "The High Court's decision cost the blood of the Hatuel family," said Shoval. "As far as the High Court is concerned, to allow infiltrators from Africa to enter Israel - yes! But rights for the residents of southern Tel Aviv? No!" "Destroying the homes of Jews, yes; destroying the homes of terrorists, no! Settlements for Arabs exclusively, yes; settlements for Jews only, no! "We will return Israeli democracy to the people of Israel!" he declared.